← What is the relation between annotation and comment of the VeryPDF PDF Editor? VeryPDF HTML Converter command line allows you to create previews or thumbnails of web pages in a number of different formats, such as TIF, TIFF, JPG, JPEG, GIF, PNG, BMP, PCX, TGA, JP2 (JPEG2000), PNM, etc. It also allows you to convert web pages to PDF, PS (postscript), WMF, EMF vector formats. So if you want to convert rtf to ps file format,VeryPDF HTML Converter command line will be a good software to use.The most important is the operation process is very easy to master. 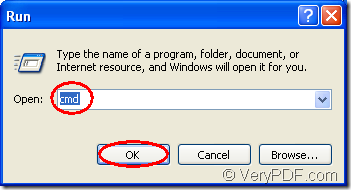 You should make sure there is VeryPDF HTML Converter command line in your computer.If not,you can download one at the website http://www.verypdf.com/htmltools/htmltools.zip .You can visit http://www.verypdf.com/htmltools/index.html to know the main functions of VeryPDF HTML Converter command line and http://www.verypdf.com/htmltools/htmltools-manual.htm can give you more information about VeryPDF HTML Converter command line. By using the command line application,you only need to know the path of called program and the path of source file. The steps to convert rtf to ps are as follows. 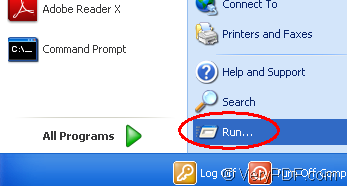 First,cmd.exe program should be opened.You can click start menu and click “run”,then input “cmd” in “open” edit box and click “OK” button.Please see Figure1 and Figure2. 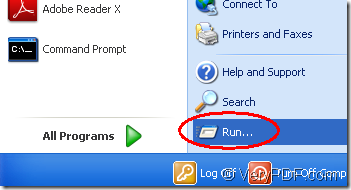 Pressing “Windows” + “R” at the same time can also open the dialog box showed in Figure2. 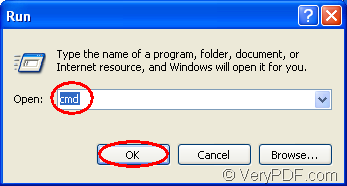 Second,then you can input dos commands in popup cmd.exe dialog box.The commands should contain the called program,source file and target file.Please see Figure3. "C:\Documents and Settings\admin\Local Settings\Temp\htmltools\htmltools.exe" is the directory of htmltools.exe which is the executable file of HTML Converter command line. "C:\Documents and Settings\admin\Desktop\jingle bells.rtf" is the directory of source file. bells.ps is the name of target file,including file name and extension name. NOTE:If you don’t specify the path of target file,it will be saved in current directory automatically. When you see “Result=OK” framed by the red rectangle showed in Figure3,you can get the new created ps format file. Third,just find the target file in current directory.Please see Figure4. How to print rtf to ps? How to set the bit depth while converting html to jp2? This entry was posted in HTML Converter (htmltools) and tagged rtf to ps. Bookmark the permalink.